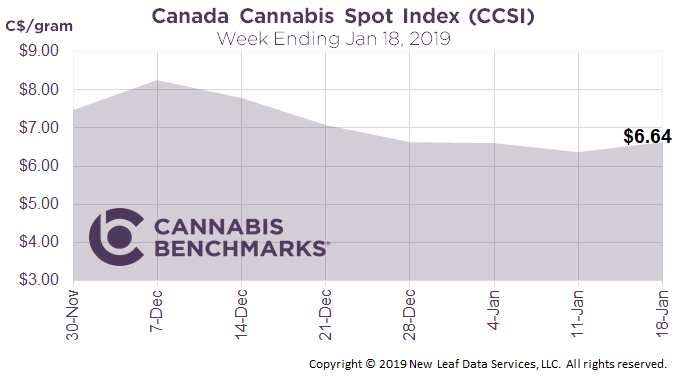 The CCSI jumped 3.9% this week to C$6.64 per gram, from C$6.38 per gram last week. The index has been stable over the past 4 weeks. C$6.64 per gram equates to US$2,271 per pound at current exchange rates. On January 15th, Health Canada released preliminary data on sales, finished inventory and unfinished inventory for October and November, 2018. The Canadian government has instituted the Cannabis Tracking System to ensure illegal supply does not cross into legalized markets. This data snapshot gives the industry a fundamental view of the first complete month of non-medical cannabis sales in Canada with lots of interesting nuggets to consider. 3. High prices pushed customers back to the black market. We’ll get a better perspective on the primary drivers for demand as we get more monthly data from Health Canada. 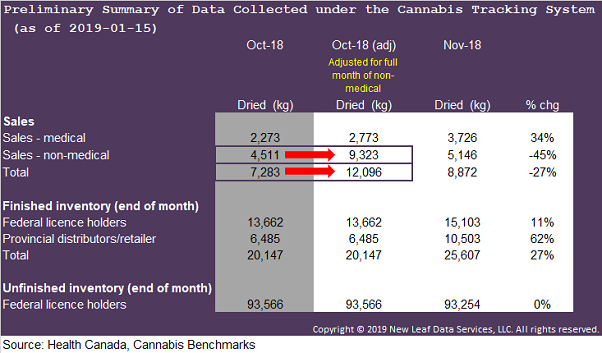 The reported amount of finished dried cannabis inventory, or product that is ready of sale, as of the end of November is also interesting. The combined inventory of Federal licence holders (inventory held by cultivators and processing facilities) and Provincial distributors/sellers (inventory held by government and privately run online and brick-and-mortar stores) was 25,607 kg., or 2.9x the total dried cannabis actually sold in November to medical and non-medical customers. Is there really a supply shortage? The last piece of information provided is the end of month unfinished dried cannabis inventory, or product that has been cultivated but not packaged or labelled. According to monthly reported data, there was 93,254 kg of dried cannabis or 10.5x November consumption sitting at either cultivation or processing operations. Can the current reported supply shortage be resolved quickly?